The CCCC Bulletin provides practical articles and legislative updates on a variety of issues affecting charities, such as governance, finance, human resources, fundraising, and government reporting. It is published by the Canadian Council of Christian Charities (CCCC), an umbrella organization of over 3,300 charities in Canada. 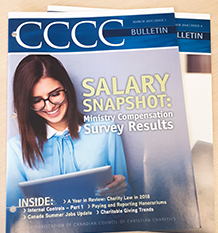 By advertising in the CCCC Bulletin, you can reach approximately 6,000 individuals across Canada who are either affiliated with a CCCC Member organization or have purchased an individual subscription to the Bulletin. CCCC Members receive free copies of the CCCC Bulletin as part of their membership. Please see our Guidelines for Bulletin Advertisers for our current schedule, rates, advertising policy, and other details. If you are interested in advertising in our Bulletin, please contact the CCCC office at 519-669-5137 or email us.